I was in New York last week. At the end of my trip, I had a few hours before I had to catch my plane so I went up to the Metropolitan Museum of Art. This is a favorite haunt of mine. Big surprise. This time, I decided to spend some time in some different areas. First I went to the Greek and Roman sculpture area. Very inspiring. I whipped out my small sketchbook that I always keep with me and practiced on these beautiful statues. I believe that every artist should practice sketching as much as possible, daily at least. This is the artist’s equivalent to a musician practicing scales or an athlete throwing pitches. You should do it enough that capturing what you see before you becomes second nature. I usually travel with at least a small sketchbook, a commercial permanent ink pen, and maybe a set of colored brush pens. I like Faber Castell shades of grey or their landscape package. The subject doesn’t really matter although my sketches are usually just memory joggers. My hotel room, at dinner or the theatre, in the museum, on the street. Sometimes people will approach you to see what you are doing, however, most people won’t even notice. I’ve leaned up against buildings at night and have drawn street vendors on Times Square, stretch limos, the night buildings in fog. The drawing makes me “see.” There are many better draftsmen than me…but it works for me. Try it yourself. Also, check out Urban Sketchers for some real inspiration. 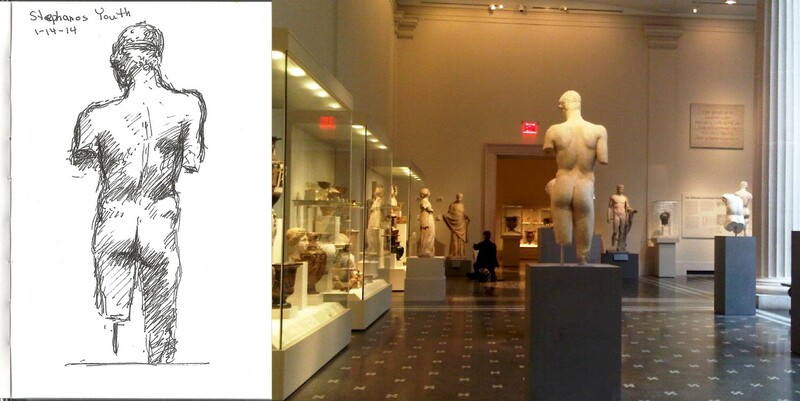 This entry was posted in art, pen and ink and tagged art, kit miracle, metropolitan museum, pen and ink, sketching, three graces. Bookmark the permalink.